In days gone by, those who couldn’t afford shoes or socks would tie a rag around their toes and feet as a make-shift sock. This ‘look’ was worn by scoundrels, criminals and thieves – hence it’s offensive connotations – but I’ve also heard that boys wearing toe rags might hang around canal tunnels. They would offer to leg a working boat through for a cheaper rate than the official leggers might charge – hence they were cheeky little toe rags! Legging or leggin’ it means to propel a boat through a tunnel (without a towpath) by lying on planks and ‘walking’ along the walls or the roof. Toe rag is now sometimes spelled as tow rag because the original background story has long since been forgotten. Crack the paddles: A paddle is a ‘trap-door’ that allows or prevents water to flow through a lock gate. So the phrase just means to wind the paddles up on a lock gate. Strapping in: This means stopping the boat on a post of some sort using a rope. Cheesing the ropes: Cheesing is to tidy your ropes by winding them into a lovely spiral shape. “Some things vary by area. In the Fens, paddles are known as slackers or penstocks and on the Severn a narrowboat is a longboat, and what we call a cabin shaft on the canals is a hookshaft on the Severn. In the Fens we also call a dock or mooring a staithe, and a man-made drainage channel is a lode. Other waterways words are used right across the network; such as butty, which is a cargo narrowboat that has no engine and is towed by one that does. A barge however is a canal or river cargo-carrying boat with a beam (12ft or more) that is about twice that of a narrow boat. The term is often incorrectly used to describe any boat carrying goods on a waterway. The place where a canal narrows under a bridge is known as a bridge hole and a flight is a series of locks rising uphill with pounds in between them. Inside each lock you will find a cill, which is a doorstep on which the lock gates sit. 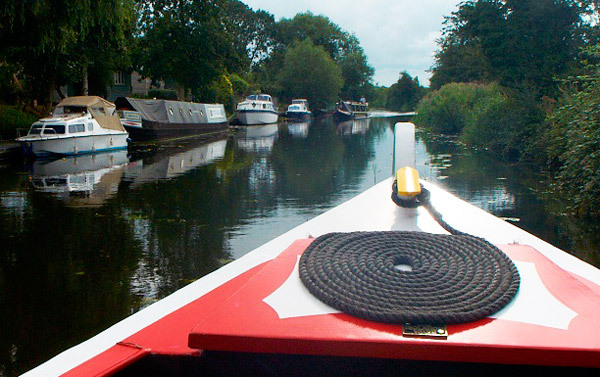 A winding hole is a short length of very wide canal, used as a place to turn a boat around, and it is pronounced ‘whin-ding’; not ‘wine-ding’. It is so named because the wind can be used to help the boat to turn. However, my favourite canal word is probably Gongoozler; meaning a bystander who enjoys watching the activities of boats and boater as they pass by. What’s your canal lingo like? Do you have any favourite words or phrases? Let us know on Facebook or Twitter.